The Coyote Johnson auction will feature 100 muscle cars and parts hidden away for almost 40 years. There’s a huge range of vehicles on offer from the old to the more up-to-date. The accompanying video below giving you a taster on what’s on offer. The collection ranges from 55 Chevy’s up to later model Trans Ams, spanning over different buildings. All the cars were bought, driven then stored away for safekeeping by the owner, presumably meaning most of the vehicles are in relatively good condition. From the video you can see quite a few project vehicles, but most seem to be complete, especially those classics such as Mopars and the vast majority from the classic muscle car era such as Chargers, GTO’s, Chevelles and Cudas, to name but a few. The full inventory of what’s available is yet to come, but it seems there are quite a few convertibles in the mix, with hopefully a few rare options. 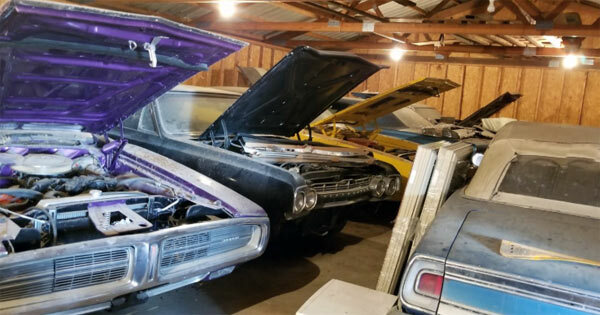 The auction will take place on Saturday September 14, 2019 at Montgomery County Fairgrounds, Red Oak, Iowa 51566. To find out more about the auction visit our webpage here.